Some people are bigger dopes than me even. Yesterday when my iPod fell out of my bra and into the bucket of polyurethane I went right to the internet and asked the universe about my dilemma, and – sure enough! Here was some poor schlub looking for help with the same predicament on Yahoo Answers. I dropped my iPod in some paint yesterday, and I need to know what would take the paint off. I was quite pissed when it happened, seeing as how the iPod is less than a week old. Also, I forgot to add, it is the iPod classic, not an iPod touch. . .
Was the guy who wrote that kidding? He was, right? Wasn’t he just messing with poor Don or have electronics really changed so much that you can do this? I also don’t believe that if I leave the iPod out in the sun the cloudy tornado that now lives on its screen will dry up and go away. My pal and fellow blogger at The Freelance Retort says it will but how can it? Because I didn’t ‘just’ drop it in water. I dropped it in a petroleum-based goo that never dries but just goes on resisting the circular stains from your drunken guests’ cocktail glasses. Here’s another picture of how it looks now, a lot like yesterday’s with the black cloud in the middle only this one also act as a recommendation for the podcast Stuff You Should Know from How Stuff Works.com.. While I was stripping sanding staining coating sanding coating etc. etc. I was listening to these podcasts, about beer and sweat and whales and the so-called the Lost Continent of Atlantis. I listen to podcasts day and night now and am getting very, very S-M-A-R-T -when it comes to things other than living in the real world, anyway. BUT! 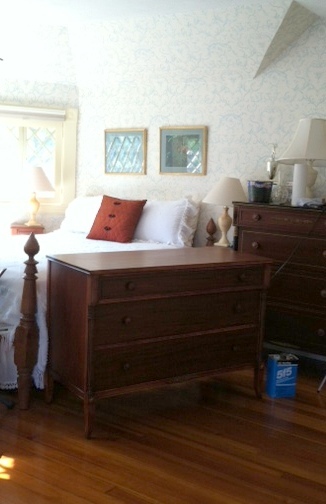 Of the two beds and two bureaus I’m rescuing from 60 years of dried cracked varnish and – yup! – water rings, one bureau is finally done! When things don’t work right,, my friend’s sainted grandmother would say: “Just kick it.” That always sets things right By the way,, what’s an Ipod? ha ha you can’t fool me you wellesley grad! 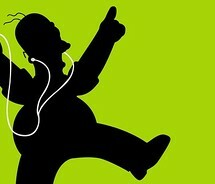 you know what an ipod is!